Many people who choose to move to Bandon come from the dry and/or densely populated areas in California, Arizona, Nevada, and the Willamette Valley of Oregon. Seeking freedom from extreme temperatures, drought, population crush, noise, traffic and an overwhelmingly fast pace of life, many folks wanting a change find what they’re looking for in Bandon. The mild coastal Mediterranean climate of Oregon’s South Coast means temperatures that rarely dip below 40 degrees in the winter and rarely reach above 80 in the summer. Snow and ice are nearly unheard of, as is the need for air conditioning. If it feels too warm indoors, one needs to only open the windows for cool fresh air. The winter rains keep the area lush and green the rest of the year. Receiving an average of about 59 inches of precipitation a year, Bandon does not drown in rain, but wildfires and droughts are not concerns for its residents. 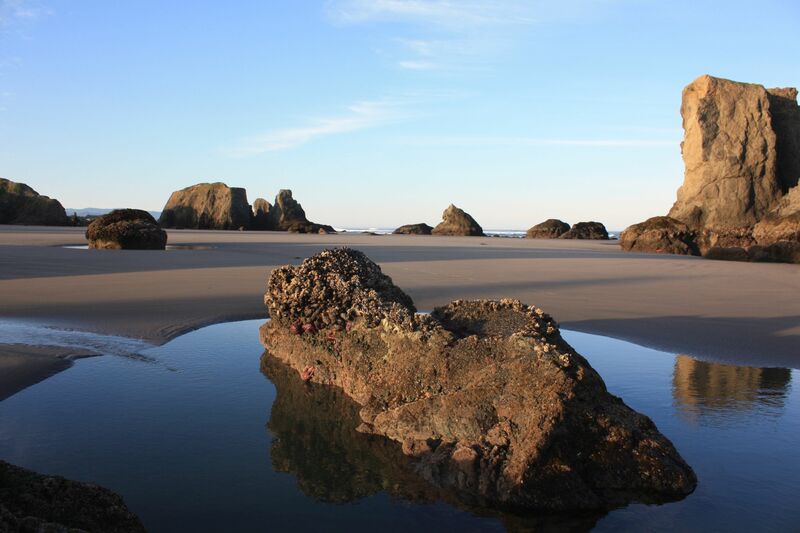 Bandon’s population of approximately 3100 people, along with the tourist presence, is big enough to find a variety of interesting people and support the basic amenities. Necessities and perceived necessities such as grocery stores, drug stores, a hospital, library, coffee shops, and great restaurants can be found within a couple miles radius. However, the population isn’t enough to create the big cities’ ubiquitous noise and traffic. For those who need more than Bandon can offer, the larger towns of Coos Bay and North Bend approximately 25 miles to the north and with a combined population of nearly 26,000, has some larger stores and more restaurants to choose from, as well as an airport serving Seattle and San Francisco. An 85 mile drive takes people to Roseburg where they can find a number of big-box stores to serve them. The metropolises of Eugene and Portland are within an easy 3-5 hour drive for a big city experience. Anyone spending any time in Bandon realizes fairly quickly how friendly and kind people are in this small town. It is easy to move along anonymously in a city, and for some, this can begin to feel lonely. In Bandon, people recognize each other as they move about their days and greet each other personally and warmly. Although not everyone in the town will be best friends, it is comforting to truly know others and be known. People also choose to move to Bandon for the outdoor activities, and the mild climate of the south coast is conducive to them all. Biking (both road and mountain), hiking, kayaking, windsurfing, fishing, and much more are possible for most of the year. Bandon has become particularly well-known for its world-class golf course, Bandon Dunes, and the many other quality golf courses in the area, and golfers come from around the world to play their courses. It almost goes without saying that one of the key reasons people move to Bandon is its stunning natural beauty. Regardless of the season, the unspoiled beaches, vast ocean, rolling dunes, sunsets, and fragrant green pine and cedar forests invigorate the body and calm the mind, working to undo the years of concrete, office buildings and cars.